POVCOMP 2004: Viewing Page for "Christmas Eve"
XIX century scene depicting Christmas Eve. In the scene I tried to show off many POV-Ray features. Among others mesh objects which have ability to handle huge amount of data with a minimal memory footprint. 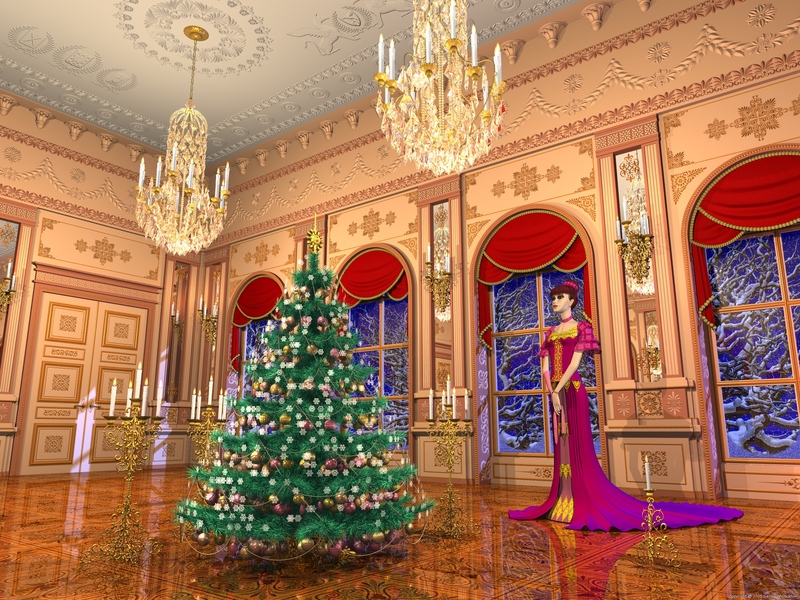 Chandeliers and Christmas tree are such mesh objects. Another example of making complex organic shapes is height_field ornaments. Lady and trees is an example of using objects prepared in another programs and exported in POV-Ray format. The chandelier was the first object, which I created. 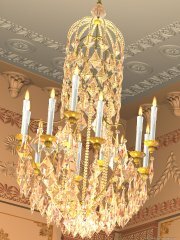 It is a compilation of numerous chandeliers which I saw in many photos depicting royal palaces. I created my own design which was more appropriate for my scene. The whole object was completely modeled from POV-Ray primitives. In order to save parsing/rendering time I created crystal as a mesh object from manually placed triangles. Each crystal has reflection and refraction and was placed in the chandelier by the script. 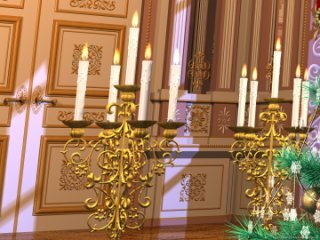 All candles in the chandelier are blob objects with a media flame. Then I prepared about 30 ornaments in Illustrator (majority of them was used in the image). All ornaments are my own variations of patterns which I found in the books. I tried to keep the same theme for all of them with dominating fleur-de-lis motif. Illustrator was used because of its vector graphics, which I needed for high-resolution height-fields. After that all ornaments were processed in Photoshop by adding black-white gradient, which is necessary for height-fields. I used a trick for making chiseled objects described in Photoshop 4 Wow! Book. Even though that was 2D technique it worked just fine for preparing height-fields. Floor ornament is a texture map and was also created in Illustrator. Numerous paper sketches were drawn for architectural elements. All of them are pure POV-Ray objects with height-field ornaments. The curtains on windows are comabinations of bicubic patches created in sPatch and POV-Ray spheres with slope texture. Ice on window is just one blob object consisting many non-proportionally scaled sphere blobs placed by script using onion texture. Lady was modeled in sPatch and also exported in POV-Ray format as a set of bicubic patches. All textures for that model were developed in Illustrator and Photoshop. Her hair is a mixture of image maps and mesh hair placed by the script. I spent a lot of evenings during 1 month to finish the model and all textures. The Christmas tree is another pure POV-Ray CSG object. Each needle is a mesh for memory saving. All branches, twigs, needles, garlands and toys were placed by different scripts. The outside trees and snow on those trees were modeled in POV-Tree. For that purpose I modified that Java program for saving tree models as a set of blobs rather than mesh. The snow is the same tree blob model were each blob was moved up. The distance equals to blob's radius. This way the gap between twigs' tips and snow was avoided when you create snow just as a copy of the tree model. Falling snow is a combination of the plane with bozo texture and disc objects placed by the macro. Many other scripts and macros were used in different places through the whole scene. Three coat of arms in the ceiling are just symbols of the traditional art- crossed pencil and paintbrush (left), computer graphics - mouse (right) and POV-Ray - sphere on checkered plane (center) as something in the middle :) Two chimeras keep another coat of arms - 'Blind Crow' which is a coat of arms of my friend who implicitly influenced this image. The models for coats of arms were created in sPatch. Then I applied to the objects gradient black-white ambient texture in Z direction making highest point in the object white and the lowest point black. This way I prepared black-white images which were used as bump maps in the final image. Total parsing/rendering time for 2400*1800 image was about 90 hours on P4 Linux machine with 1GB memory runing POV-Ray 3.6. Borders, Frames and Decorative Motifs from 1862 Derriey Typographic Catalog. The Enschede Catalog of Typographic Borders and Ornaments. Victorian Frames, Borders and Cuts. Victorian Patterns and Designs in full color. The Photoshop 4 Wow! Book. Very detailed modelling. I'm not sure of the point of the picture though, and the character is much too stiff.